Ague talks about when he worked as a mover after graduating high school. "You know, I was so happy. I had the day's work, and all I had to do was focus on that. We could stop working when the clock said it was time, and then I could go have some fun. I didn't have to think, just enjoy myself. And the next day, I went back to work. It was the same thing, over and over, and I got paid for it. That's what made me happy." It was a life with no complaints, just working and playing. Then one day, he borrowed a men's fashion magazine to read from a colleague in the company break room. What caught his eye was a molding clay that turned silver when you fired it. He was so interested, he went to Tokyu Hands [a Japanese hobby and general goods store] that very day. 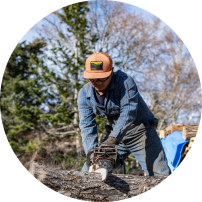 "The moment I started making stuff, I found it so interesting, I got hooked. 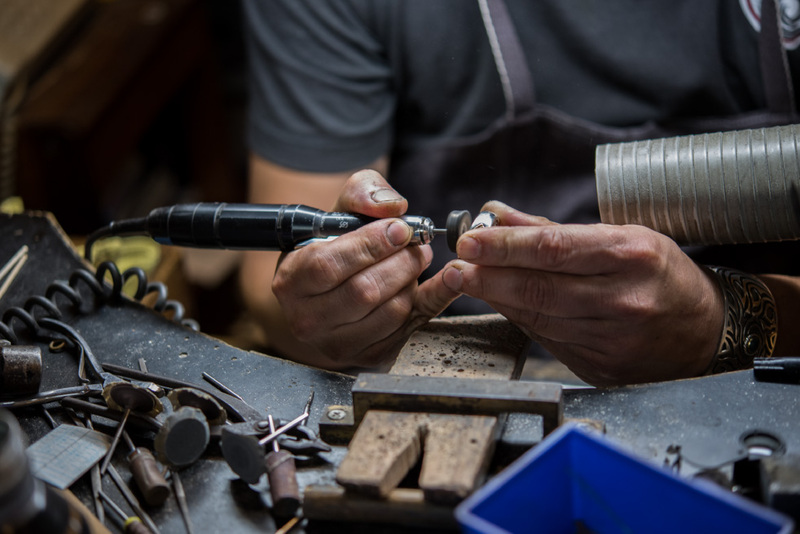 It turned out that one of the clerks at the tool shop used to be a jeweler, so he knew a lot about it. Whenever I couldn't figure something out, he taught me everything I needed to know." He would go to the shop after work and stayed there talking until it closed. That went on for two years. "It's kind of a sweet story. The man used to tell me 'I bet now that you've got all these cheap tools, you figure it's about time to get some 100,000-yen stuff, right? But if you keep buying things just to try them out, you'll run out of money! So, you should go to jeweler's school.' I'd never even thought of that. I was like 'What? There's a school for this?!'" He was advised that if he went to jeweler's school, he could use the expensive equipment all he wanted. Around the same time, his other friends started talking about pursuing their own dreams. "So, I thought, what do I want to do with my life? And when I thought about it, I realized I'd always had this vague longing to be a craftsman. Since I'd found making jewelry so interesting, I figured I'd go all in on it." 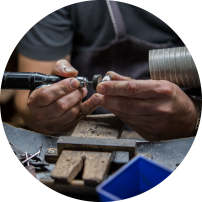 He went to consult with a friend of his who'd succeeded in making his own dream come true as a bartender, who had also bought his jewelry for basically the cost of materials. "I went and said, 'I really want to dive into this world,' and he just said, 'Sounds good!' He stood behind me the whole way... And here I am!" 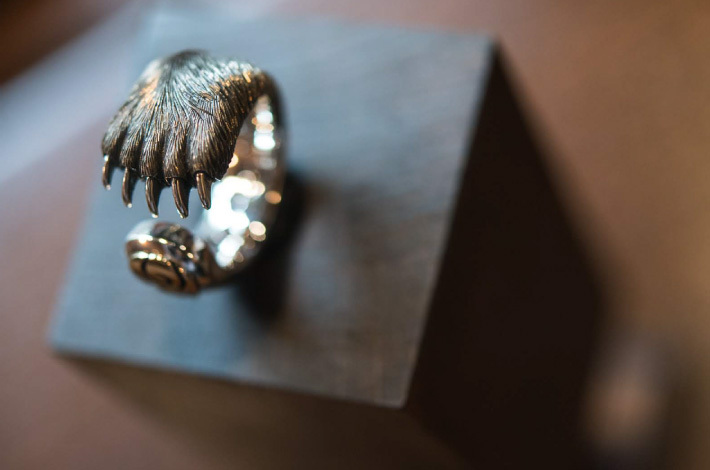 The Bear Ring was his first original design. The idea came from a friend's single comment. "At jeweler's school, me and a classmate friend opened a stall as a design festival thing. One of my friends from high school came, but he took one look at our stuff and just said 'Boooriiing.' And that was the first time I realized it. I had to think about what I really wanted to make." Up to then, making things had just been fun. Ague had been imitating designs he saw elsewhere, but once he began worrying over his own designs, he couldn't finish any projects for about 6 months. In the course of trial and error, though, he came up with the Bear Ring by accident. 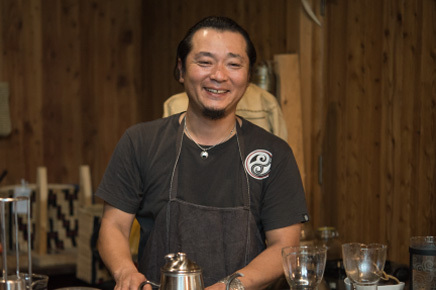 "When I was in elementary school, my hobby was collecting handicrafts from all over. My parents were from Hokkaido, and we would go back to visit sometimes. One of Hokkaido's famous handicrafts is bear carvings, you know? Of course, an elementary school kid couldn't afford something like that on their allowance, so I'd just stare at them, and then go home. But I burned those carvings into my brain. At that point, though, I still hadn't really considered Ainu designs." After graduating high school, he came to Hokkaido for fun every year by motorcycle. On one such trip, he met a man by accident at a highway parking area, and when he saw Ague's bear ring, he said 'You should go to Nibutani.' So, Ague did. It was at the Nibutani Ainu Culture Museum that he first saw authentic Ainu clothing. "When I saw those old, traditional, real Ainu clothes, I was like 'What is this?! This is amazing!' It was almost a shock. That's when I started to be really drawn to the Ainu people." He then went to the Kaizawa Folk Art shop, which sells Ainu handicrafts. "They have a little cottage there for motorcyclists. When I saw it, I just felt like I had to stay, so I did. And it was free! I helped out at the shop, and walked their dog, and ate with them... And before I knew it, a month had passed." 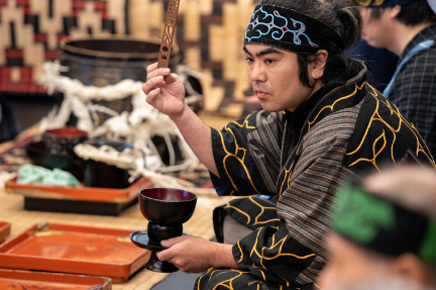 There were Ainu craftspeople nearby the shop, including Toru Kaizawa, and so Ague was able to watch woodcarving up close, and even had the opportunity to help weave the fabric for traditional Ainu attus [robes]. Attus fabric is made from the bast fibers of Japanese elm trees. Bundles of the inner bark are boiled in a large, bath-tub sized iron pot, then split, joined, and twisted into thread. "They said it was time to start weaving, and they told me to run over and hang the thread on a hook about 12 meters away. So, I kept running back and forth like that. At the time, I thought 'What am I doing this for? I want to go to the museum!' but when I look back, they were giving me such an incredibly valuable experience." That same year, he headed to Lake Akan for the first time to see a magnificent bear carving he'd heard about. He received another shock in the basement exhibition space under Kuma no Ya. 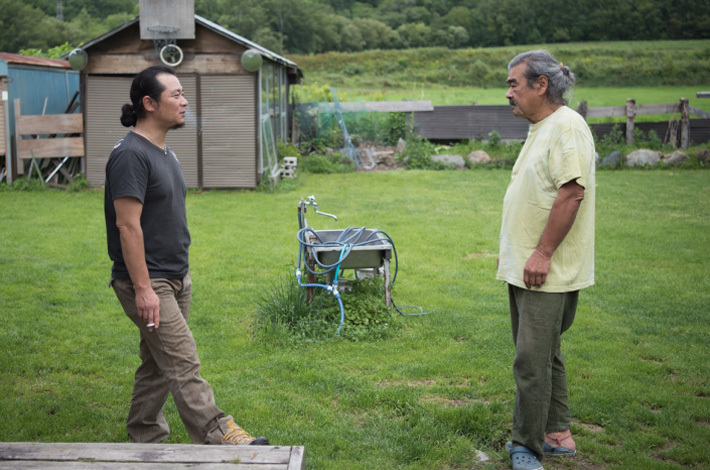 His first sight of Takeki Fujito's bear carving left him speechless. "I saw it, and it was truly incredible, and for some reason I thought 'I want to beat this.' After that I'd go carve my own, and think 'yes, I did it!' then go back to Lake Akan all full of confidence. But I'd take one look at Takeki's work and have to start over. It happened over and over." At the time he was living in an apartment in Tokyo's Nakano ward. 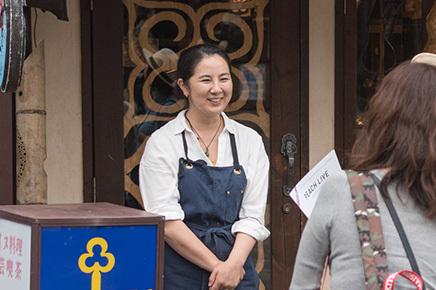 By accident, he spotted a sign in front of the station saying an Ainu food restaurant had opened in Nakano. 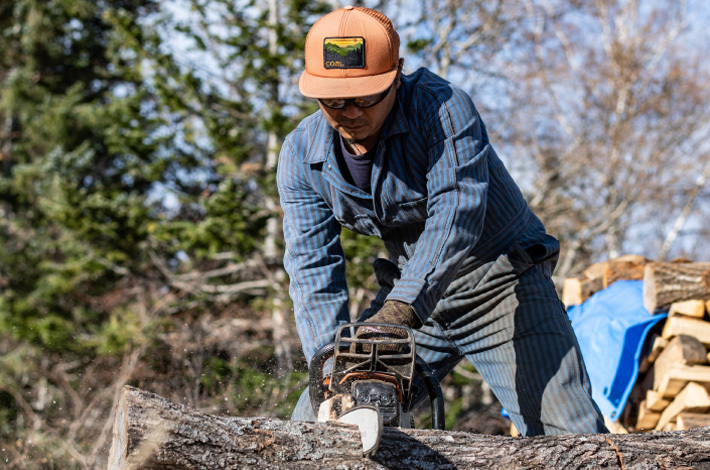 The idea of Ainu food struck a chord, and when he went, there was a man carving wood near the entrance. "I told him 'I saw this amazing bear carving at Lake Akan, and now I want to do that too,' and he said 'At Lake Akan? That was my brother's!' That man was Koji Fujito. It was an accident, but it was fate, too." He enjoyed it so much, he became a regular at the shop. It was around that time that people, including Koji, began saying "There's this girl you have to meet." That was how he met Emi, who now lives with him at Lake Akan as his wife. Emi is Ainu herself, from the Akanko Ainu Kotan. It was a string of fateful meetings worthy of a television drama. 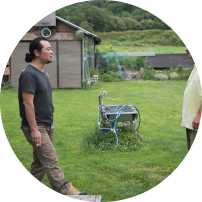 Life changed for them after the Tohoku Earthquake and Tsunami, and he began thinking about moving to Hokkaido. 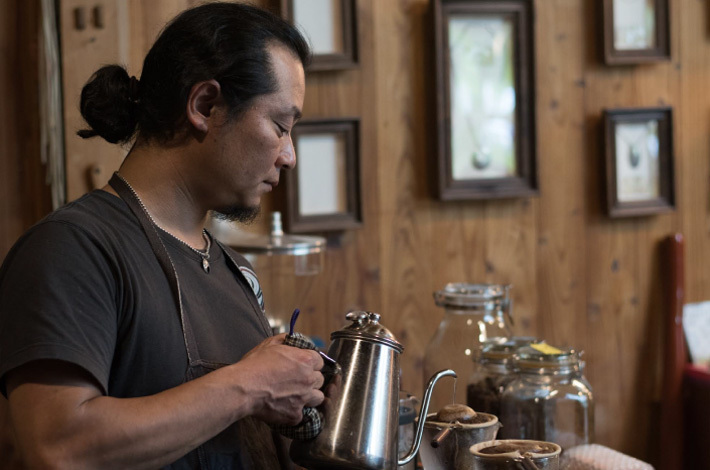 “Around that time, I talked to Emi and asked where we could find good coffee after the move. The two of us can't live without good coffee! So, we decided to roast our own. We justified it by saying 'Hey, we could open our own cafe!' (Laughs)." When they moved to Akan, they once again benefited from the kindness of others as Ague was given his current studio building. Many guests come to the studio saying they wanted some of Ague's coffee. They have barbecues in summer, and spend the night playing guitars and singing. In winter, they find other ways to enjoy the bitter cold, which can reach a record -30°C. "Some of the older people in the business tell me 'We're so jealous! You're cheating at this!' When you work in the fashion world, you have to keep your guard up, right? You have to　appear different from everyone else. 'You don't need to worry about all that,' they say. I'm just living life the way I want. The interesting stuff just happens. But I don't really give it much thought, you know. It's like that old story about the 'Straw Millionaire,' I just keep running into these good people." 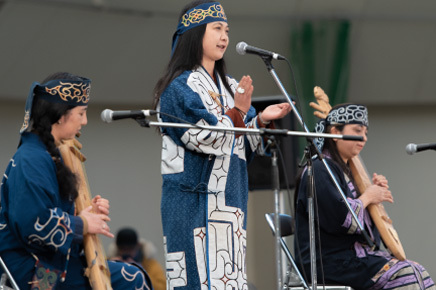 To the Ainu people, bears are known as Kimunkamuy, a spirit of the mountains. Perhaps a Kamuy sleeps in the Bear Ring as well, and it sent him on his journey to encounter the Ainu in his life.